During a search for wildflowers along the damp, shady nature trail that leads south from the road to the soccer fields, I found a plant with a very peculiar leaf. I had never seen it before, in books or online. I emailed a photo of the plant to Sally Ann Scalera, who quickly identified it as Old world climbing fern, a nasty exotic and invasive plant. Sally is Horticulture Agent II/Master Gardener Coordinator, UF/IFAS Brevard County Extension. She has kindly offered to help me with plant identifications, including sending specimens or photos to the Herbarium at UF. According to the UF/IFAS Center for Aquatic and Invasive Plants, this invasive exotic fern is climbing into trees and shading out native vegetation in hundreds of acres in east-central Florida. Dense growth of the plant can also be a fire hazard, frequently enabling small ground fires to reach into tree canopies, where it can kill the growing branches. It has the ability to "resprout" from almost anywhere along each climbing leaf. What looks like a stem is actually a climbing, freely branching leaf (frond), which may become as much as 100-ft long. There are two types of leaflets--fertile and infertile. 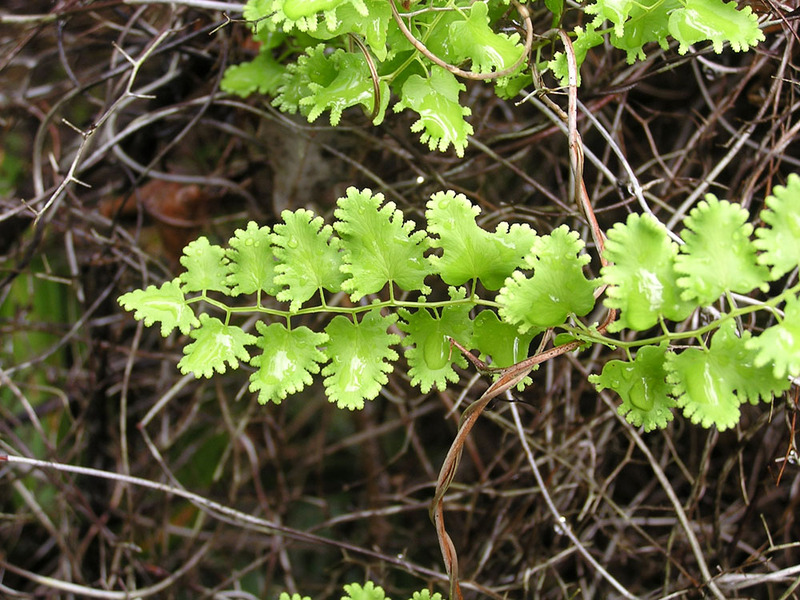 A fertile leaf, like the one shown here, produces new climbing ferns. You can see more photos of the plant, as well as a short video about climbing fern, at the above link.